As a result of living in an era of hectic lifestyles, intensive working days and increasingly less stable timetables, we tend to spend less time to sit down and have dinner, and we often have meals at undefined moments. This clashes with our intention to enjoy a healthier, more balanced nutrition. “Consumers nowadays are seeking healthy ready meals to consume at any moment, whether at work, while commuting or after a gym session. 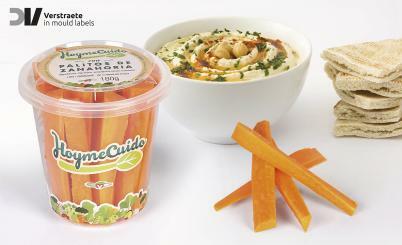 In order to meet this demand, Agricola Villena decided to launch their carrot sticks: a delicious, natural snack that is easy to eat, as it can be eaten raw or dipped into sauces or hummus as a crudite.” explains José Navarro Maestre, President of Agrícola Villena. For this new launch, the agricultural firm was in need of a packaging that would enhance the product’s freshness while allowing for the full preservation of the carrot’s organoleptic features. By working together with ITC Packaging and Verstraete IML, Agricola Villena has managed to obtain the new MyPack, a customized packaging that is also the first in applying the Ultra Clear technology. With a 240ml capacity, the packaging is also thermo sealable, thus allowing for longer product shelf life. It also features a special lid that optimizes shelf stacking, thanks to its particular shape. This IML packaging is the perfect combination of protection, prevention of food waste and to top it all off, it’s fully recyclable.